The Magic Touch Giveaway Hop is all about the magic in stories. I personally love to read books filled with wizards and witches. From the magic in Alice in Wonder Land and the Wizard of OZ, to the Harry Potter series and The Lord of the Rings, they all send me to another place and time. Children’s stories are filled with wonderful magic, but so are adult stories like Shakespeare’s A Mid Summer Night’s Dream, HG Wells’ The Time Machine, and Yann Martel’s Life of Pi. For me, though, as a romance writer, I think the real magic happens when two people touch for that first time and the spark ignites between them. Following is just such a scene from my new novel–ICE blue. The sparks certainly begin to fly here for Troy and Angela, but the scene is merely a prelude for what is to come. Read on, and in the end, don’t forget to leave a comment for a chance to win e-copies of heartbeats and freefall! Then click the button to continue on with the hop. Enjoy! “Maybe I should.” Then he was helping her slip into her coat. He turned her toward him, pulled the lapels closed to protect her from the cold. He looked down at her and once again they were face to face. Angela swallowed hard. Her senses filled with the sweet scent of the wine still on his breath. It mingled enticingly with his aftershave. “Yes, I believe you did.” Although she’d seen it reflected in his eyes. Thanks for visiting me here. Please leave a comment for entry into my giveaway, then click the button below to follow on with the hop! And we have a winner! Mary Roya, you have won a free e-Book of both heartbeats and freefall. Congratulations. This hop was fun. Thanks to all of you for stopping by my site. 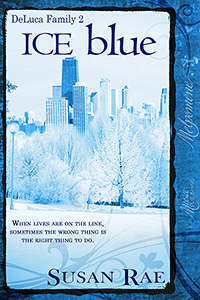 I’m pleased to say that ICE blue is getting some great reviews! Click the reviews tab on the page header to see what critics are saying about my latest sizzling suspense! I think a lot of the magic that happens isn’t able to be seen. Reading about it, having the pictures form in your head, not on a screen, I think are more powerful. I love a book that can pull the reader in and make you feel the emotions of the characters to the point that you are crying right along with them, that’s magic at its finest. Thanks so much for this international giveaway :-).. Suspense is my favorite genre. Hope to win. Am following your blog!. Would be great if you could check out my blog too! I am looking forward to reading Heartbeats. Great giveaway. I am love hops; you get to discover tons of new blogs, authors, books and wins lots of great prizes. This is extra awesome with magic & swag. Ice Blue sounds like a very interesting read! Enjoyed the excerpt. Thanks for sharing and thanks for the great giveaway. Thank you all for your comments and for stopping by. Remember, the hop runs through the 30th. Enjoy! Love suspense and I love magic. Ice Blue sounds awesome! Thanks for being in the Magical blog hop. Keep writing so I can keep reading. I had wondered the same thing about whether I needed to read one first. Thanks. Yes there is awesome magic in the witches and wizards, but there is also great magic in the gentle touch written in a wonderful book. Thank you for sharing this excerpt with us today and for your generous participation in this awesome hop. I like many of the magical books (and their movies) that you’ve mentioned. Your book sounds great, although I am trying to forget about snow and ice. Kind of hard to do when I looked out the window this morning and saw snow on the grass and it’s April 20! Seriously, I loved your first book, so I’m sure I’ll like this one. Yep, the snow this morning was ridiculous! And yes, if you loved heartbeats, you should really like this one. It is the sequel but has even more going on in it than heartbeats did. But even for those who haven’t read heartbeats, they can still enjoy ICE blue because the romance centers around a new hero and heroine and it has it’s own suspense plot which is complete within the novel.